It has been a couple of months since my last blog; believe or not it is hard to do so. It requires commitment and dedication. I think I would add my blog to my new years resolution list, which I will not publish as it has some personal goals as well. Other than that, this is Alyssa's progress blog. 2011 has been good to her. 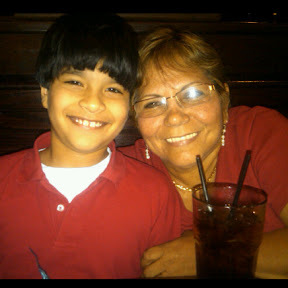 She was discharged from the cardiologist and gastroenterologist as her heart condition and reflux resolved on it's own. 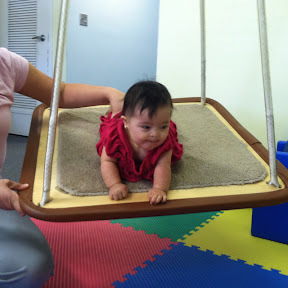 Therapy had been a blessing, as she started to crawl by 10 months among other things. Her therapists, our extended family, Gloria, Dr. Dee, Dr. Shay, Maritza, Pam, Robin have been a blessing in her life. Therapy is part of our lives and will be forever just like toys are. Day 13: on assignment "what I love about Down Syndrome"
Hello my mom and dad are taking me to Downtown Disney and I am so ready. Finally I just gave up ...maybe next time. 1. She made me appreciate life as a precious gift. 2. Because of her I learn to be a better mom. 3. I wake up every morning with a purpose. 4. I accepted therapy is a way of life. 5. I have met a wonderul group of people. 6. I treasure every day as it is the last day of my life. 7. I learned that education never ends, we learn from others everyday. 8. I learned to live one day at a time and not to worry so much about the next day. 9. I noticed how well I am raising my son and how humble he can be to others. 10. I learned how to be a true advocate. 11. She has made me a better nurse and care more about others. 12. I also learn to respect other more than ever. 13. I learn that being different is just nothing but another way of saying you are unique. 14. Because of her, I am more open minded. 1. Flattened nose. It is so small a kiss can cover it all. 2. Small mouth. It is so little, but give the best slobbery kisses ever. 3. Protruding tongue. It is so cute and I know it is out when she is happy or when she is really tired. 4. Upward slanting eyes. The corner of her eyes is called Epicanthal fold. They are so beautiful and clearly expressive. 5. Wider Gap on Sandal toe. It is another characteristic of Down Syndrome.Besides of being so cute to smell and make her laugh, it is great for Sandals and to grasp toys as well. I said it many times, Down Syndrome does not define my daughter, but her characteristics make me embrace her and love her even more. Rewind 15 years ago, the life expectancy of a person with Down Syndrome was about 25 to 30. Mostly due to lack of medical care. Nowadays, their life expectancy has increase twice. We are now treating heart problems prior the first year. Our kids have greater risk to be born with congenital heart defects(such as AVSD or VSD), hematologic malignancies such leukemia, gastrointestinal diseases such hirschprung disease, hypothyroidism and Altheimers disease. 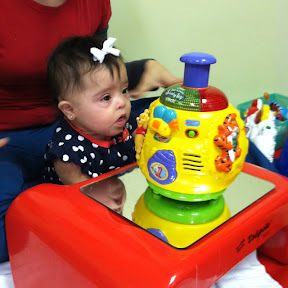 Target therapies and prompt interventions to this matter are beinG addressed by pediatricians, therefore, follow ups are just as important as the "3" therapies: Physical, Ocupational and Speech therapies which help our children grow up get involved in the community and helps them eventually into adulthood. I have to say as a second time mom, my previous experience was 11 years ago, I don't think I ever appreciate Chris' milestone like a I do with Alyssa. 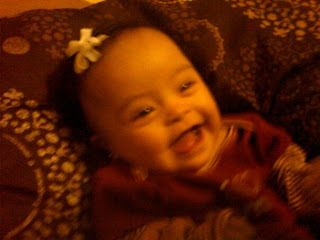 Babies with down syndrome due to low tone are supposed to hit the milestones a little behind that ordinary babies. 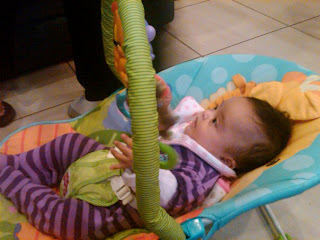 I remember Alyssa's first milestone was turning from belly up at 4 months. Sitting started at 7 months, she started rocking on all for at 10 months and started crawling at 11. Now, I could only say, I have to be more careful as she knows how to crawl, she is very sleek and try to be very quiet about it, so I cannot leave it alone on the bed anymore. 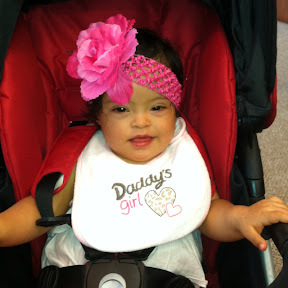 In celebration of everyday in October, here is my day 2 tidbit about Down syndrome awareness. 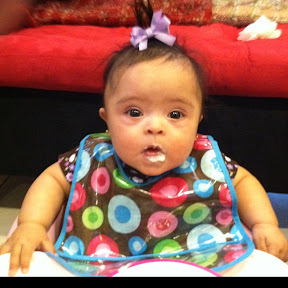 Down syndrome is the most common genetic condition. It noted as a person with Down Syndrome has 47 chromosome instead of 46. There are thee types of Down Syndrome. Trisomy 21 or nondisjunction is the most common one, 88 to 95% of our kids have it. It is due to a failure of one pair of chromosomes to separate evenly. 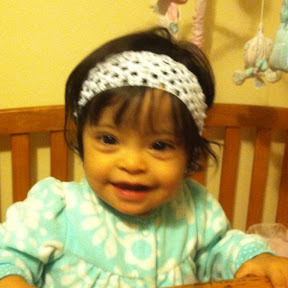 Translocation Down Syndrome occurs when a piece of chromosome breaks off and attaches to another. About 4 to 5% of the kids with Down syndrome are born with this type. Alyssa is one of them. Usually parents need to get tested as this is the only inherited one and one of the parents could be a carrier, yet it can only be an spontaneous occurrence. Mosaicim Down Syndrome is the least common type, 1 to 2%. It means some of the cells have a typical number of chromosomes and some cells have an extra one. Welcome October!!!! I have been waiting for you with anticipation. My Alyssa just turned one year old two days ago, so it is also the anniversary of her Diagnosis. Funny thing, she was born premature, she was supposed to be born in October. Little did I know about Down Syndrome then. I was scared of it. Yes, I said it!!! Nowadays, I don't consider myself a master in the topic, but I know that Down Syndrome is not different than us. People with down syndrome have dreams, feelings, learn at their own pace(so do others), love. Maybe they do love more than others. At one year old, my Alyssa is crawling, sitting, babbling up a storm, waves bye bye, and doing her favorite thing: blowing raspberries! This month, lots of us are committed to blog 31 for 21, for all the days of October and for the chromosomes of our kids. This is my way of saying: I'm here too. Hope someone reads and learn a bit of Down Syndrome. Don't be afraid!!!! It is amazing how time goes fast, like a blink, I still remember how hard it was to know about the diagnosis and how long it has taken to accept it. Now Alyssa is six months, she is learning how to seat, she turns at her own wish and her arms are strong enough to pick up her bottle. 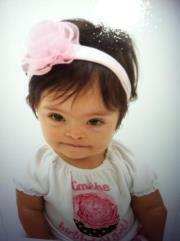 I do not believe Down Syndrome owns her, but I do understand it is part of her. I am so proud of her. On March 21, we celebrate Down Syndrome Day, so in honor of it, I am translating a song from Asindown. This group put a video for the song Dejanos entrar! , Lyrics and Music by Carlos Lopez. I think we can relate and others can learn. We love our kids as they are, but others need to open their eyes and notice them more. I hope I do justice to the original song with my translation, so please forgive me if I mess up the meaning of a word. I tried to keep the translation as much close, but sometimes you can not translate something in Spanish with the same word in English. Below the translation, you will find the lyrics of the song in Spanish, courtesy of Asidown website. I propose you do the same with the "witch"discrimination. As I woke up this morning, I noticed it will be Alyssa's first Valentine's day. I also noticed how much my love for her has grown. I remember when Chris was born I fell immediately in love with him, in a different way, a motherly love way. When Alyssa was born, I wish I could say it was the same. My heart was aching and full of fears from the moment of her diagnosis, but as time has gone by, my heart is full of hope and love. Today as I hold her in my arms and embrace her, I thank God for giving her to me and making me realize of his greatness. Happy Valentine's Alyssa..Mommy will always love you!